Rawdon Roofing construction services can provide chimney reconstruction, brick chimney repairs, partial chimney rebuilds, roof line up chimney rebuilds, or total chimney rebuilds. Cracking, water leaking, element exposure, usage, time, and lack of maintenance can render your chimney structurally vulnerable, inviting the need for chimney repairs, or requiring a chimney rebuild. 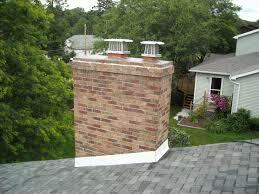 Partial chimney rebuilds: small chimneys (no scaffolding) or only the top few courses of a large chimney. Roof line up chimney rebuilds: Substantial mortar and/or brick deterioration has eliminated the possibility of a pointing restoration. The structure is torn down to the flashing area near the roofline, and then the chimney rebuild commences..
Total chimney rebuilds: Complete tear down of the outer layer of the brick on a chimney. In most cases the firebox, hearth, and smoke chamber do not have to be removed (minor brick chimney repair is usually sufficient). Total chimney rebuilds are necessary when the chimney is leaning, has severe mortar deterioration or severe brick spalling has occurred from ground level up, etc. A chimney crown is of the greatest protection for the masonry construction beneath it by helping to prevent the need for fireplace chimney repairs & chimney rebuilding. It is the top element of a masonry chimney rebuild. 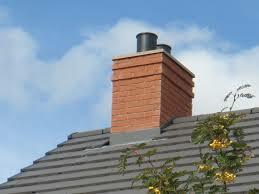 It protects the top of the chimney starting at the fire clay flue liner & hangs over the chimneys edge (drip edge). Most masonry chimneys that have “crowns” are built inadequately. These “crowns” are constructed from common mortar mix, the same mixture used to lay the bricks of the chimney. This mortar is not designed for and will not withstand years of weather abuse without cracking, chipping or deteriorating; situations that allow water to penetrate the chimney and cause the need for fireplace chimney repairs & chimney rebuilds. All the brick and other materials that make up your home are protected by the roof and eave, all that is, except your chimney. The chimney sits up above the roof and is exposed to rain, snow, wind, and freezing. Masonry materials deteriorate very quickly when they absorb moisture and are exposed to the elements, causing undue stress and integrity loss.